Services | FG Tax Associates, Inc.
Income Tax Returns: Our highly capacitated staff is here to help you understand all about your taxes providing you with the most competitive service of the market. Thanks to our high level of knowledge and updated with the latest government reforms and changes we make sure that all possible deductions are considered. 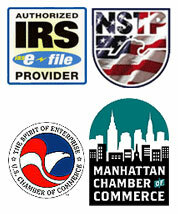 E-File: The fastest way to receive your income tax refund is the IRS e-file program. The Federal/State e-file option allows tax payers to file federal and state income tax returns electronically in a single transmission directly to the IRS. Direct Deposit: When you fill your income tax returns with us, we provide you with the option to have your refund deposit directly from the IRS, into your saving or checking account. Procedures for divorce: No need to go court or your spouses signature. Free Notary Services: If you are a current client, come in for free notary services. Documents Translations: We offer Spanish/English – English/Spanish translations.